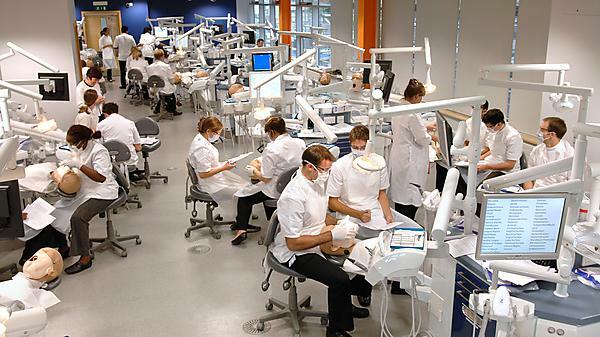 Simulated Dental Learning Environment (SDLE) is a purpose built suite of 32 dental chairs which allows you to learn how to deliver dental treatment in closely supervised simulated clinical surroundings. Each pod in the SDLE is an identical replica of a dental surgery with a 'phantom head' on which you can practise techniques. In Years 1 and 2, you spend a day each week in preparation for working with real patients in the clinical dental education facilities in Plymouth and Truro. As competence is gained in the different aspects of clinical dentistry, you undertake these tasks in the clinics under the supervision of highly experienced general dental practitioners. Throughout the rest of the course, you return to the Simulated Dental Learning Environment to further develop new and more complex skills which can then be transferred to your patients in clinic.